This past Wednesday, March 20th, we celebrated our Annual End of Season Banquet. We would like to thank all of our volunteers who showed up earlier during the day to set up and decorate the tables for the banquet. We all began to arrive around 5:00 pm for the social “1/2 hour” with all of our wonderful dishes to share. The club provided the ham, roast pork, chicken and roast beef. The other dishes from our attendees were a variety of salads, vegetables, pastas, bread and desserts. 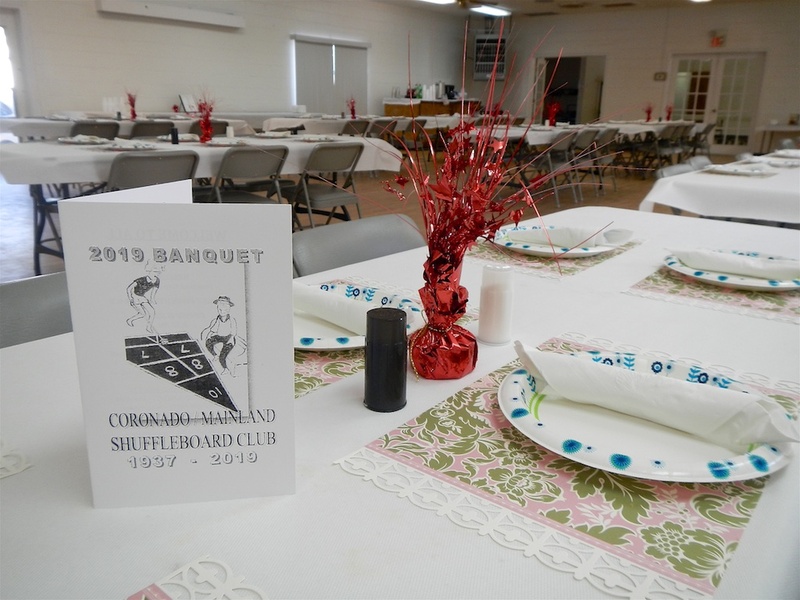 We had over Seventy (70) members and friends attend the banquet from Shuffleboard, Mahjong and Cribbage. Marguerite was bustling around supervising the setup arrangements and everything to do with the kitchen. Bonnie and Randy were collecting for the 50/50. Tom Carbonell and Allen Best were getting the stage set up for the after-dinner Bingo and door prize awards. Tom called the gathering together and we welcomed all our new members. He presented Felix Piscitelli with a Life Membership. Allen Best made comments about the highlights and results of all the activities we participated in during the year and mentioned that Mary Harlow was in the hospital. John Holder was also ill and would accept phone calls (428-5998) if you would like to call him. Tom gave recognition to our three team leaders for Intercity; Mary Ann Pabst, Rich Kordeleski and Jerry Jabaut. He also recognized Barb and John Fortini for winning the Trophy for Group A in the final Intercity tournament competition. Sid Pomainville awarded the winners from his Cribbage season. Tom then called Rich, Marguerite and Bonnie to the stage and awarded them a gift card as thanks for all the extra hard work they had put in during the season. Tom also welcomed our special guests, Carolyn and Richie Burrell who have been our faithful Northern District Directors, as well as them helping others learn how to become a Tournament Director. Bill Boyes was thanked for putting together our Banquet Program. We also cheered the work Bill and our volunteers are doing with the SPARC group on Wednesday evenings. Tom also congratulated our four club members who have been elected to the Board of the Northern District Shuffleboard Association. Congratulations to Rod Lewis (2nd VP), Arlene Jabaut (Secretary), Mary Ann Pabst (Treasurer), and Jerry Jabaut (Alternate State Rep). We drew the 50/50 and Mary McConnell was the lucky winner ($$$). Bob Tager lead the installation and swearing in of our re-elected Club Directors, John Fortini and Jerry Jabaut. Bob also managed to cleverly train and organize the attendees to receive for himself a standing ovation. Then we had the drawing of door prizes. 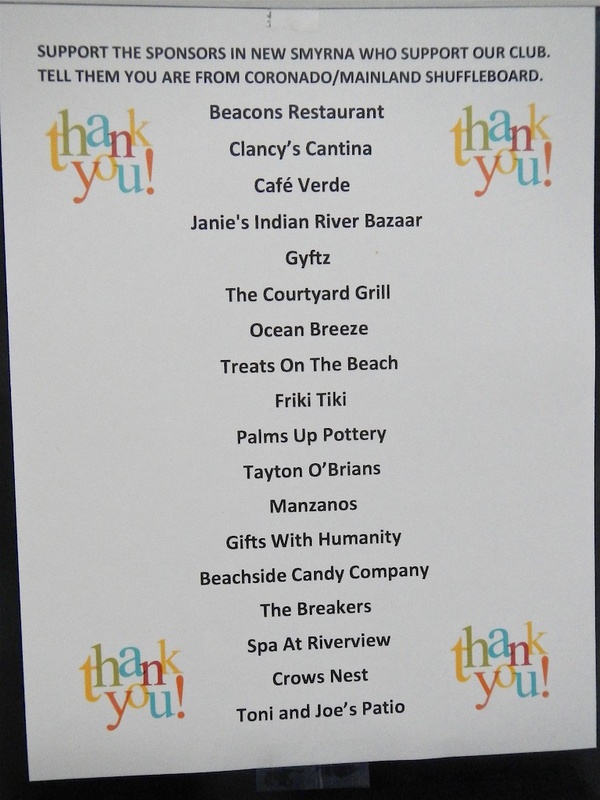 We would like to thank all of our wonderful sponsors and remind the members, when they are out and about, to support these sponsors and tell them you are from the CMS Club.